Carl's Pool – Feel like shooting a game of pool? Billiard must be one of the most popular games of skill there is, right up there with table football (foozball / kicker), darts and beer pong (just kidding about the last one!). Pool players will agree that there's nothing quite like playing a few games in the local pub or billiard café—but what about when you're alone and there's no pool table in sight? Virtuality is the answer, and more specifically games that can be played on one's smartphone. Carl's Pool is a good example of such a game, so let's take a closer look at it. There are so many billiard games available for Android, but we braved the sea of options, plunged in, fished around and came out with Carl's Pool. This particular app may seem somewhat simple and not very flashy at first, but it proves to be quite a good game that can even be played by multiple players. Carl's Pool is about 2.4 MB and can be moved to SD card. Straight away it becomes apparent that Carl's Pool goes beyond being a simple pool game for those long winter nights at home. 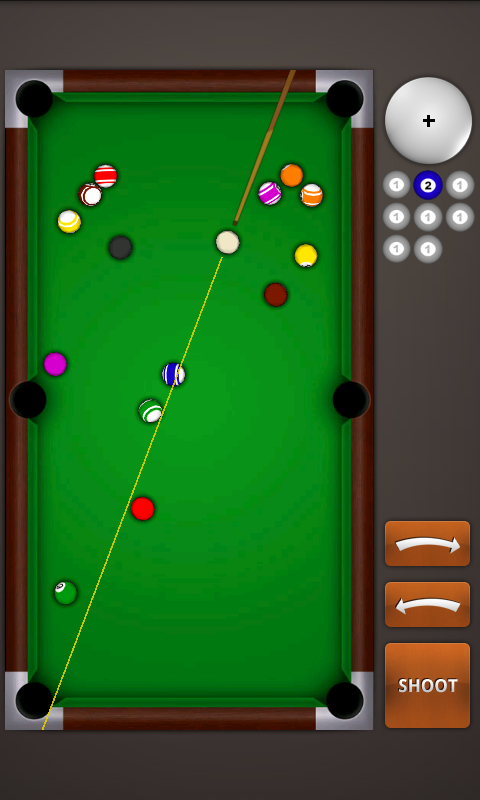 Firstly, the single player mode is extensive and includes 8 Ball, 9 Ball and Make 15. There are varying degrees of difficulty as well as an option to play against real live opponents, which is especially fun when done using a tablet. Then there's also the multiplayer mode, for which you need to register. You can then select to play against specific opponents or have a random generator select other players for you. 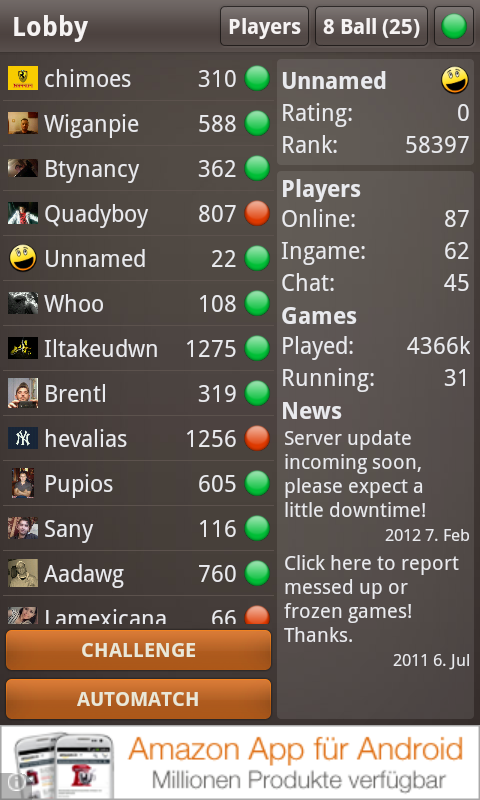 A great feature: the chat function within the game. There are different challenges to keep you on your toes, such as winning or attaining a level within a certain amount of strikes. A had a good chuckle when I saw the “Fall asleep on multiplayer” challenge, which I mastered straight away. I appreciate the attention to detail that went into making this app, making it very user friendly. For instance, you can look up the rules to the different games in case you're not sure about something. Furthermore, results / highscores can be published – ahem, shared – via Twitter and Facebook. Carl's Pool is a must-have for billiard fans. 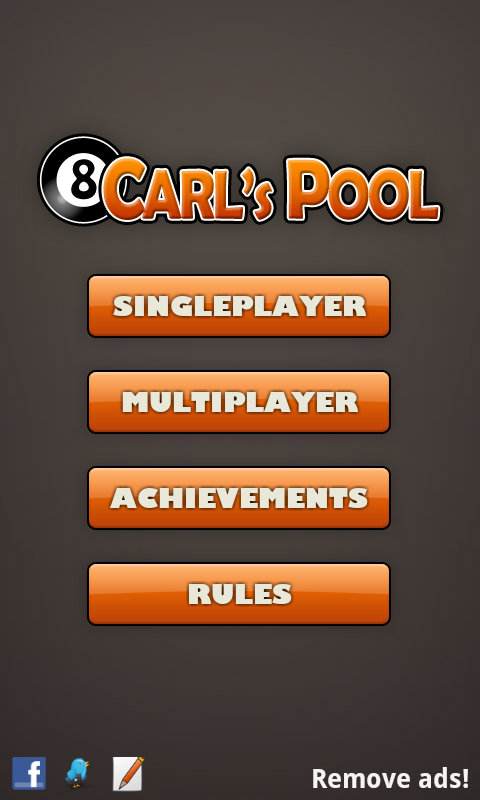 The app's name may be momentarily misleading (Carl's Pool sounds a lot like carpool, don't you think?) but in effect it's simple, it's efficient, it's a nice, not-flashy app for people who love playing pool. Using Carl's Pool is easy and hassle free, and there's an intro that explains how the app works to first time users. Playing this game on a tablet is more fun than on a small smartphone display, especially when playing with friends, but playing on smartphones is perfectly acceptable. Carl's Pool runs well and there's not much to complain about in this department, save the fact the MP mode can be somewhat laggy depending on how good or bad the internet connection is. Carl's Pool is free and you can find it in the App Center. A pro version is available without ads for EUR 1.50.